WINNIPEG - The Edmonton Eskimos rallied late, really late, came from behind, and found a way to beat the Winnipeg Blue Bombers 33-30 in the second-longest game in CFL history on Thursday night. With southern Manitoba being battered by severe weather all evening, it didn’t take long for Mother Nature to make her presence felt at Investor’s Group Field. The game was stopped on two separate occasions as torrential downpours and constant lightning engulfed south Winnipeg. With 8:41 to go in the second quarter and Edmonton up 17-7, referee Andre Proulx signalled for both teams to head to the dressing rooms due to severe weather entering the area. After 83 minutes play would resume but would once again get halted, this time with 1:24 left in the second quarter and the Eskimos up 19-14. The second break would last another 92 minutes before the teams would eventually come back at 11:52 pm. And it wasn’t even half-time yet. In total, the game was delayed 2 hours and 55 minutes, and when all was said and done, the Eskimos and Bombers had played in the second-longest game in CFL history, lasting five hours and 42 minutes. On the turf, as expected, it took a little time for the clubs to find their rhythm. Bomber quarterback Chris Streveler, making his first career start in the CFL, was sacked on his first play from scrimmage, and threw an interception just a few plays later, but improved as the night went on. The 23-year-old’s debut was filled with ups and downs, finishing the night throwing for 178 yards, three touchdowns, and two interceptions. Edmonton got on the board first when Reilly found Derel Walker with a 101-yard bomb to put the Eskimos up 7-0. The Eskimos would add a field goal before Winnipeg would get on the board. Streveler found veteran receiver Weston Dressler with a 22-yard strike, recording his first career CFL touchdown pass. The Eskimos answered with a Reilly touchdown to take a 17-7 lead before the skies opened up. After the delay Streveler notched his second touchdown pass of the night, this time a 22-yard toss to a wide-open Darvin Adams in the end zone, and the Bombers were within three. Immediately after the touchdown Mother Nature came back for an encore, but it wouldn’t take the momentum away from Winnipeg. Sean Whyte missed a 45-yard field goal on the final play of the half, and Kevin Fogg ran the ball back 101 yards for the touchdown, giving Winnipeg their first lead of the game 20-19. The Bombers went for a two-point conversion but couldn’t capitalize. 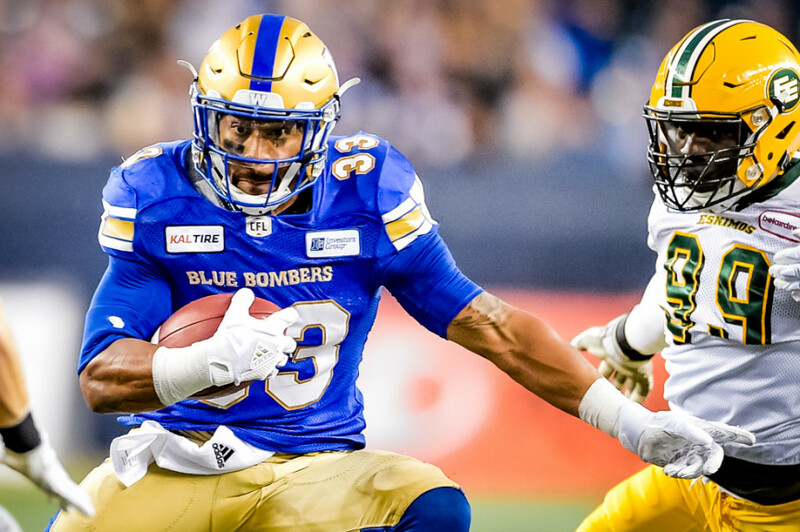 Streveler threw his third touchdown pass of the game, this time a 20-yard toss to rookie receiver Drew Wolitarsky, picking up his first CFL touchdown and giving the Bombers a 27-19 lead. The two clubs would exchange field goals before Mike Reilly showed why he’s considered the best quarterback in the CFL by many. With just over five minutes to play, Eskimos quarterback Mike Reilly took the ball on his own 20-yard-line and led his club the length of the field before scoring a one-yard touchdown to get Edmonton within two. Reilly then hit Nate Behar on a two-point conversion to tie the game. 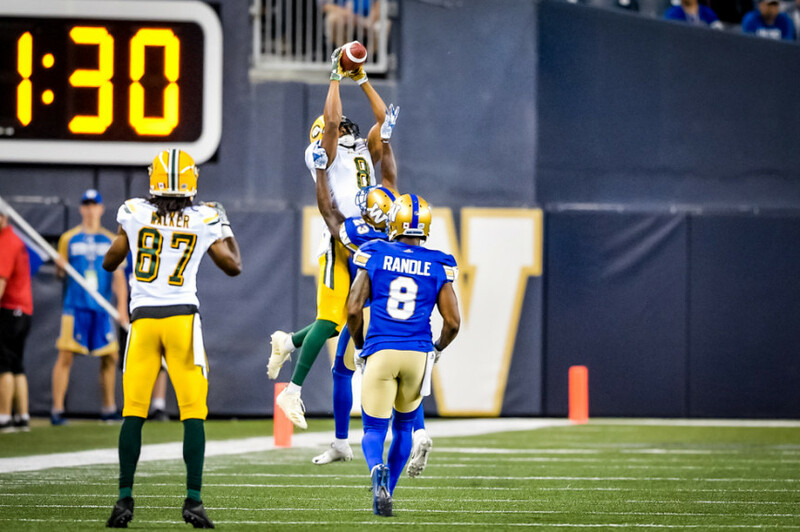 The stage was set for rookie Chris Streveler, who had three touchdown passes in the game and 1:12 on the clock, but the 23-year-old went two-and-out, killing just 13 seconds, and the Eskimos would get the ball back with 49 seconds remaining. Reilly moved the chains up to the 38-yard line where Sean Whyte made no mistake on a 44-yard field goal with just eight seconds left. The final whistle went at 1:17 am at Investor’s Group Field, sending the 4,000 or so brave fans who stayed to cheer on the Bombers. 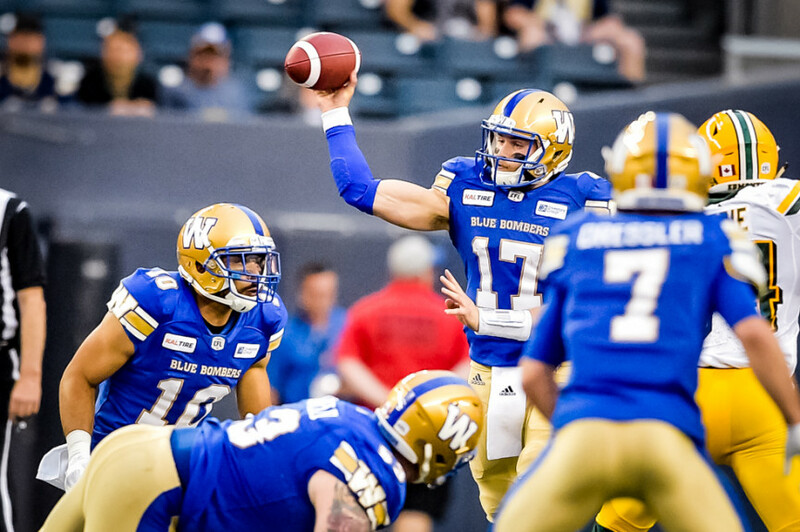 Rookie Chris Streveler went head-to-head with one of the best quarterbacks in the CFL, and had the Bombers leading in the final two minutes of the game. After a shaky start, Streveler started using his quick feet, and his decision making improved as the game went on. Kevin Fogg finished the night with a 101-yard kick return and had a key interception in the end zone with Edmonton pressing in the fourth quarter. Winnipeg’s defence gave up 487 yards on the night and were unable to get the key stop on the final two drives of the game, both of which Edmonton scored on. Next action for the Bombers is next Friday when they travel to Montreal to face the Alouettes.